A guardian can quickly sign up a participant for a membership, drop in or free trial through a simple and intuitive process on the member connect site. On the member connect site, navigate to the membership you want purchase for your family member or to the class you want to register them for. 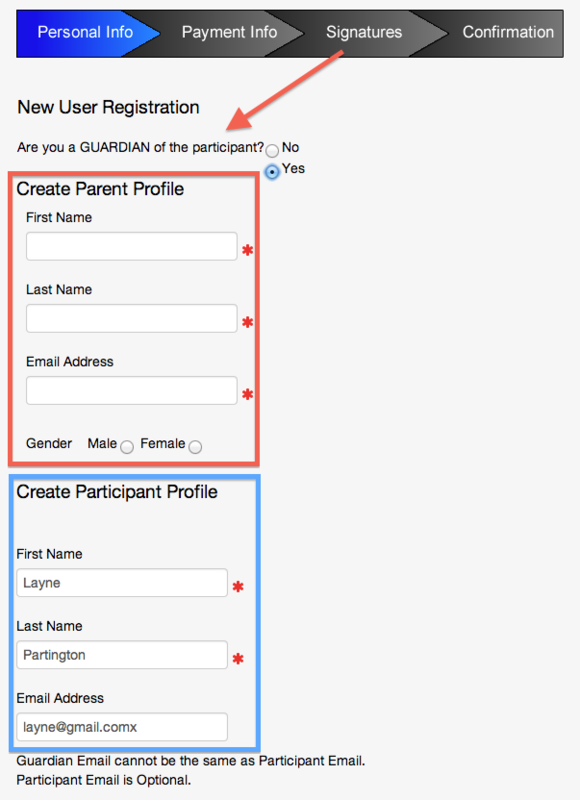 Click on the button to sign up for the option you want, then select the radio button to indicate that you are the guardian of the participant. The screen will then refresh to show a new area to enter the participant's info and to upload a photo for the participant's profile if you choose to do so. NOTE: Adding a participant email is optional, but if you do, it must be different than the one entered in the Parent Profile section. After you click "Continue" you will be led through the rest of the sign up process which you can visually track with the bold progress bar along the top. When you have finished the sign up process you will be taken to your profile where you can review the current memberships and reservations for all the people on the family profile, including the sign up you just finalized as a guardian.